The Brays are a host family with Ayusa International, a non-profit organization promoting global learning and leadership through high school student cultural exchanges. 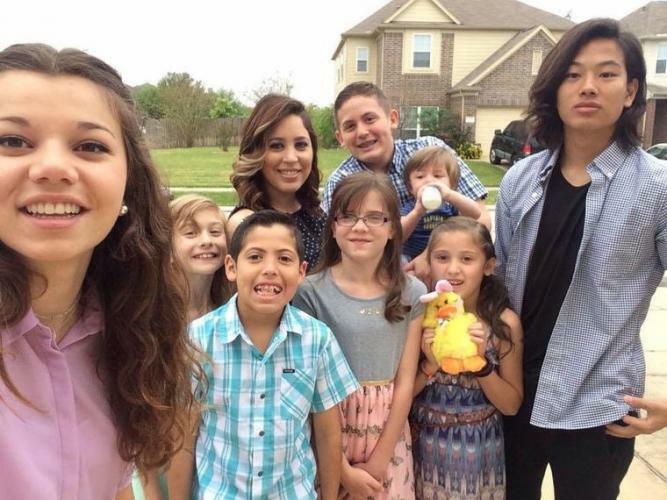 Already six kids strong, the family has hosted two students--Mahau Conti-Granteral from France and Genzo Niimi from Japan--in 2016 and four since beginning. Both students have been attending Mayde Creek High School. After a several-month stay, she said her entire view regarding her native culture and understanding unfamiliar ones changed. April sees the decision to become a host family as one of the best the family has ever made. As always, however, the life changes extend both directions. April said Genzo originally desired attending college in Tokyo, but has opened a door on the possibility of studying in America due to his experience this year. The Brays are no stranger to diversity and a melting pot of cultures. Sean himself hails from Wisconsin, while April has a “southern belle” mom and Peruvian culture on her father’s side, while the father of her first three children is a first-generation Mexican-American. April believes having been exposed to so many different cultures from an extremely young age streamlined the adaptation and adjustment process for the couple’s children when they began hosting in 2014. Not only did the children adapt, April said, but unbreakable bonds have been forged between the children and the students over the course of the school year. The Brays expanding their family during this time has also had a noticeable impact on those in the community around them. April said the family’s neighbor across the street has grown close to Genzo. “She’s actually considering it (hosting) now that she’s seen some of my students—she’s thinking that it’s fun and she’d like to do it for her kids,” she said. For Genzo in particular, Sean noted that the chance to immerse himself in the American culture did wonders for his pick up of the language that his training in Japan never could. On the home front, Sean said expanding their family also serves as a way to further expose the family’s children to the difference in cultures and open their eyes to how others view America. “Your children also get to gain another brother or sister and it's always fun to see them trying to learn your exchange student's language or customs,” April added. The now ever-connected family may now soon depart to different hemispheres, but have created bonds which will last a lifetime--and should not have any trouble keeping in touch with their new American family. What has been successful for the Brays is their belief that the students welcomed into their home are as much their family during their time in America as their own children. Though he said the students (like any teenager) have become upset at times, Sean said it eventually becomes water under the bridge due to the familial bond now created.